There are plenty of people who think content marketing has no place in the B2b marketing repertoire. They think that B2B selling is about matching product features to customer requirements, building relationships through rounds of golf, liberally distributing branded pens and business card holders and attending the annual industry tradeshow. But most B2B marketers and many salespeople have come to understand that traditional, product-focused marketing is becoming less and less effective. Unless you want your marketing to go the way of VHS tapes, LPs, CDs and iPods, it’s time to get on the content marketing bandwagon and find out what you are missing. So what’s the alternative? The key words here are ‘relevant’ and ‘valuable’. Reason #1: Long Sales Cycles In B2B marketing, with its long sales cycles, content marketing fulfils the valuable role of nurturing the prospects and positioning the firm as expert and problem solver. Imagine you work in an industry where there the buying decision comes up every two or three years. Product-focused, promotional marketing works fine for low-value, ‘impulse-purchase’ items, but in the B2B world, there are no ‘offers of the week’ or ‘buy-one-get-one-free’ discounts on enterprise software. Long sales cycles mean that interruption marketing that is promotional and product-focused will be perceived as unsolicited, unhelpful and ultimately pointless. Content marketing on the other hand – that is marketing content that is educational or entertaining to the buyer – will help shorten sales cycles by creating brand preference and will help nurture existing opportunities as well as engaging cold leads who are not currently in buying mode. Reason #2: Complex Sales Process In B2B sales, there’s often more than one person who has a say on who is awarded the contract. The end user of the product is only one of several people in the decision process. 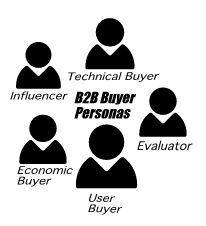 That’s why B2B marketing content must not only speak to the user buyer, but also to the host of buyer personas that are typically involved in today’s committee-style buying process. The technical buyer, for example, may be very interested in details of how the new product will integrate with the existing IT infrastructure, and will want to know about the different deployment options available. Software-as-a-Service, customisable interfaces and open APIs may be strong selling points for this persona. The user buyer will be most interested in how the new product or service will make them more efficient in their job, and help him climb the career ladder – or head home on time. The economic buyer, on the other hand, is more concerned with how the purchase supports departmental and corporate longer-term objectives. He or she will not usually be concerned with the ins and outs of everyday interaction with the purchase, but keeps an eye on the bottom-line and the strategic justification of the purchase. Marketing content that is tailored to the needs of the different buyer personas will be most effective in a B2B marketing context. Blanketing all different types of people involved in the purchasing decision with detailed product information will not help close the deal – and may even be detrimental. Reason #3: Differentiated B2b Sales Funnel As leads move through the funnel and become prospects and eventually clients, their content requirements change. Product-focused content only works if the reader already has awareness, interest as well as a desire to dive deeper into the product. 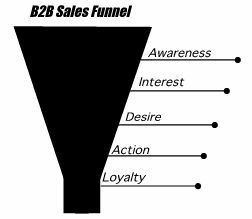 This stage is actually a short phase within the highly evolved B2B sales funnel. Good content marketing will produce campaigns that deliver valuable information at different stages of the sales funnel – big topic, industry-focused content to raise awareness, more detailed white papers, customer case studies and videos to stimulate interest, and ‘how to’, practically oriented content to create desire. Social media, in-person events and community-building marketing can then help trigger action and foster loyalty in the long-term. This entry was posted in B2B communications, Marketing and tagged Buyer persona, content marketing, sales cycle, sales funnel, sales process. Bookmark the permalink.